Are they really abandoned? Probably not! Just because a young bird appears to be alone – whether on the ground or squawking loudly from a bush or tree – doesn't necessarily mean it is sick or injured. In June, young birds, including this juvenile Northern Flicker, are leaving their nests. And most likely, a parent is near-by and will soon return. What can you do to help? Keep your cats indoors - especially during the birds' breeding season. And leave the birds alone. If you do find a sick or injured bird, visit NWRAwildlife.org, the National Wildlife Rehabilitators Association. Baby Birds – Leave Them Alone! This young Northern Flicker is calling from the ground. Sound like trouble? Well, just because a young bird is on the ground doesn’t necessarily mean it’s sick or injured. 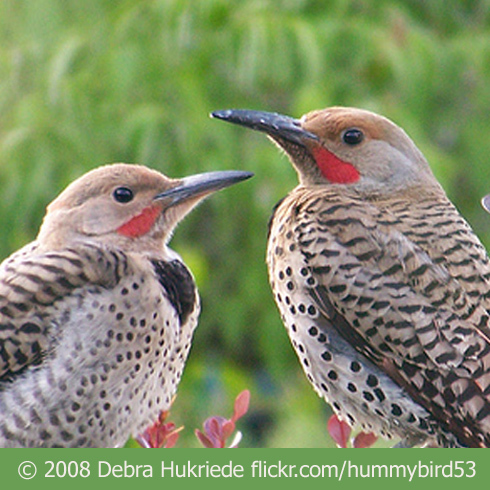 At this time of year, juvenile Northern Flickers are leaving their nests. They fledge when they’re three or four weeks old and almost as big as their parents—11 or 12 inches long. 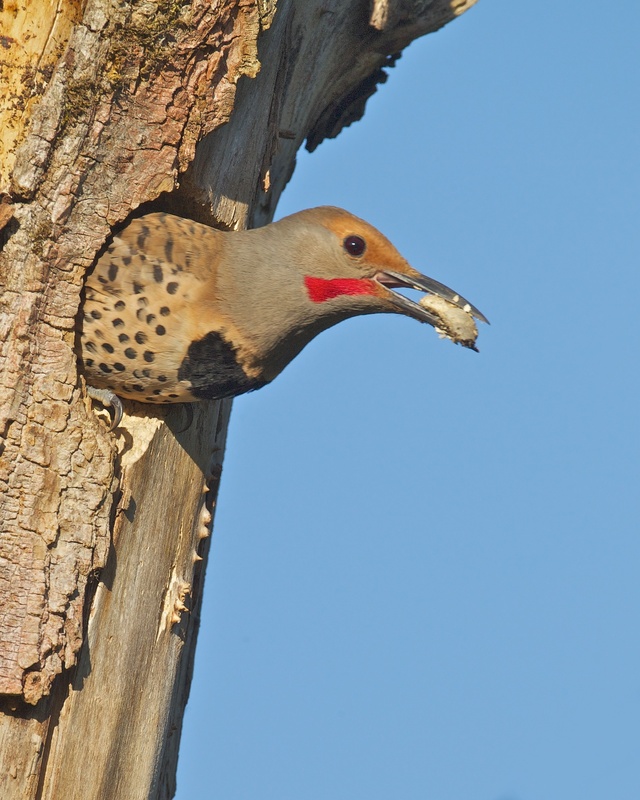 Although you may picture a woodpecker high on a tree trunk, Northern Flickers—young and old—actually forage mostly on the ground. So this young flicker, just out of its nest, is poking around in the dirt and leaf-litter, looking for ants and other insects. It makes test flights and—day by day—reaches higher and higher into the trees. But you’ll still see it regularly, beak down in your lawn, probing for food. [Socialization calls] The best thing you can do for the young flicker—and other fledgling birds, too—is to “give the bird some space.” And especially? Keep your cats indoors. Next spring, this bird will probably be drumming on your roof, advertising for a mate. To learn what to do if you do find a sick or injured bird, visit our website, BirdNote.org. We’ll help you find your local wildlife rehabilitator. I’m Mary McCann. Calls of the Northern Flicker provided by The Macaulay Library of Natural Sounds at the Cornell Lab of Ornithology, Ithaca, New York. 49068 Nestlings and adult recorded by K. Colver; wik-wik call 3 by W.V. Ward; and drumming by D.S. Herr. Find a wildlife rehabilitator near you.